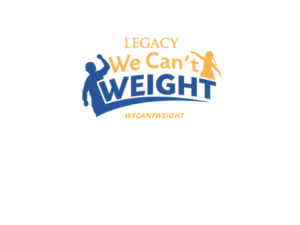 Join the WE CAN’T WEIGHT™ campaign by joining us to walk or run each Sunday (10/2, 10/9, 10/16) @ 2:45pm at the J C Nichols Memorial Fountain (47th J C Nichols Pkwy, Kansas City, MO 64111). Look for Jerald in the WE CAN’T WEIGHT™ T-Shirt by the fountain. Record all your exercise below. The “We Can’t Weight to Stay Fit” campaign is on the cusp of a rebirth. 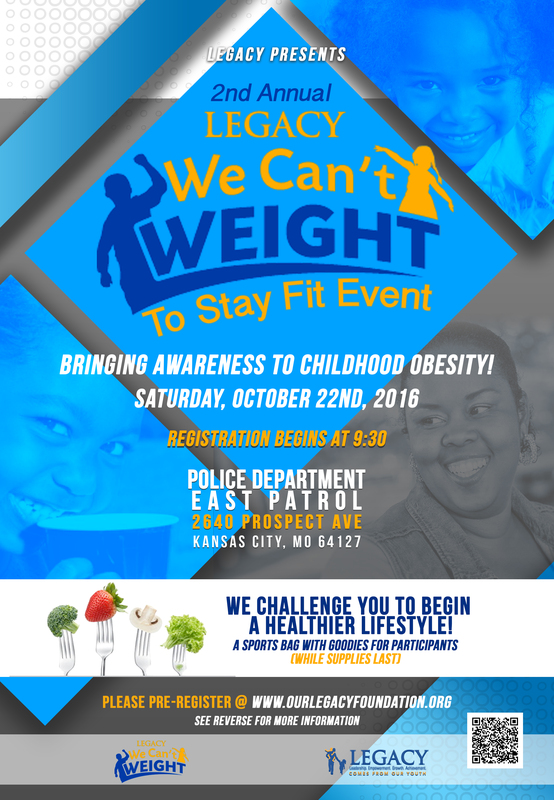 Saturday October 22, 9:30 a.m. at the Kansas City East Patrol Police Department, “We Can’t Weight to Stay Fit” 2016 will commence with a panel discussion on the state of health for underprivileged youth. Following the forum, an assembly of fitness instructors will lead a series of brief workout sessions. The endeavor – which is spearheaded by the LEGACY Foundation – should present an abundance of info on why a healthy diet is vital. “Some people have less access to stores and supermarkets that sell healthy, affordable food such as fruits and vegetables, especially in rural, minority and lower-income neighborhoods,” said “We Can’t Weight to Stay Fit” organizer Jonathan Smith said. “Studies show when people have access to a higher amount of healthy food choices, it reduces the risk of childhood obesity. That’s because obesity is greatest among minorities with a low income. So we are targeting them the most. There are a myriad of topics that will be addressed during the discussion. Learning how to develop interpersonal skills and awareness, health and wellness understanding, healthy meal preparation, the importance of remaining active, developing the knowledge to make healthier choices, and creating community gardens are among the more compelling issues scheduled to be discussed. Actually, this is the second installment of the “We Can’t Weight to Stay Fit” crusade. A few years ago the program proved to be successful. However, it was not immediately renewed. Eventually, a chance encounter prompted Smith to relaunch an improved version of “We Can’t Weight to Stay Fit”. Smith is confident that “We Can’t Weight to Stay Fit” 2016 will be bigger and better than year one of the program. Smith intends to be involved with “We Can’t Weight to Stay Fit” from a physical standpoint as well. “I have pledged to swim 100 miles before December 3rd of this year,” he said. Registration for Saturday’s event begins at 9:30 a.m. The panel discussion will start at 10:30 a.m. From noon to 1 o’clock the workout sessions will be held. And for participants only, sports bags will be issued once the previously referenced activities are complete. Also, $25 grocery cash cards are going to be available to help assist patrons in starting their healthier lifestyle. Walmart has donated items and Chris Goode – owner of Ruby Jean’s Juicery – is involved as well. 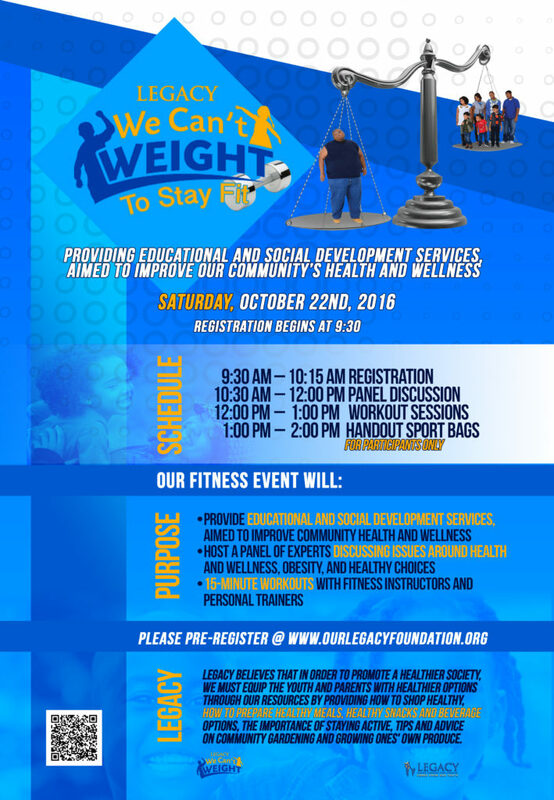 Additionally, a yoga instructor and other fitness instructors are slated to partake in the opening day of “We Can’t Weight to Stay Fit”. If you desire to preregister for “We Can’t Weight to Stay Fit” 2016, log on to www.OURLEGACYFOUNDATION.org.